The Rich vs Poor Debate: Are Kids Normal or Inferior Goods? Caplan is entirely focused on the substitution effect: having kids becomes cheaper relative to buying TVs. So he says buy more kids, and fewer TVs. But what about the income effect? As people become richer, they tend to “buy” fewer children, not more. So there’s an offsetting income effect. In a follow-up, Bryan runs some regressions that he thinks suggest that Betsey is wrong to say that the rich have fewer kids than the poor. It’s a brave person who debates Betsey on the data. And I think he’s tying himself in regression knots, rather than getting at the issue. Or we could look at the time series evidence. Gapminder lets me trace fertility and income for each country since 1960. 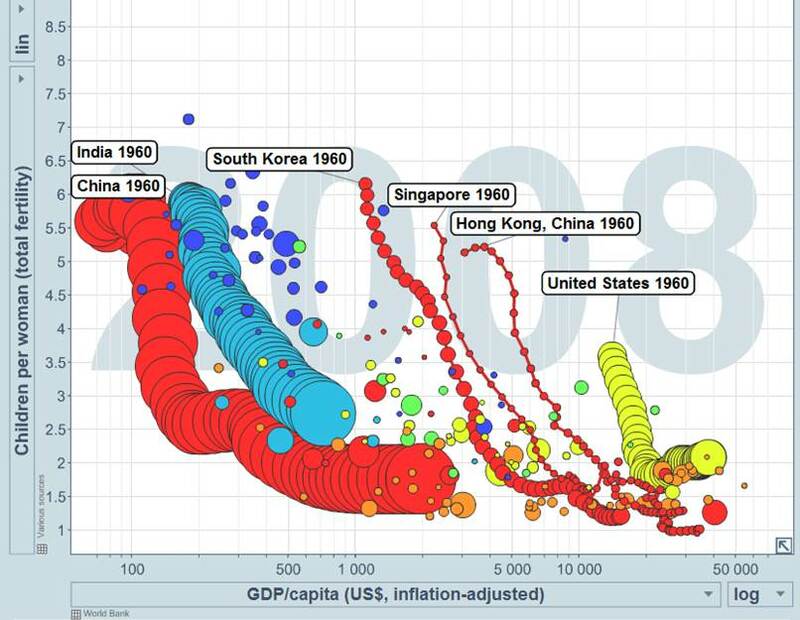 The plot below shows that as the U.S., China, India and the Asian tigers all got richer, in each case their people stopped having as many kids, too. For evidence on more countries, read this piece in The Economist. Given the time scale here, it’s not just that the invention of contraceptives changed everything— this is a long-run pattern, perhaps knocked around a bit by war. Or we could look at the cross-section, comparing rich and poor Americans. The following plot also comes from Jones and Tertilt, who compare children ever born with the average income of the occupation of husbands. (They have to use this indirect measure because the census didn’t collect useful income data until relatively recently). 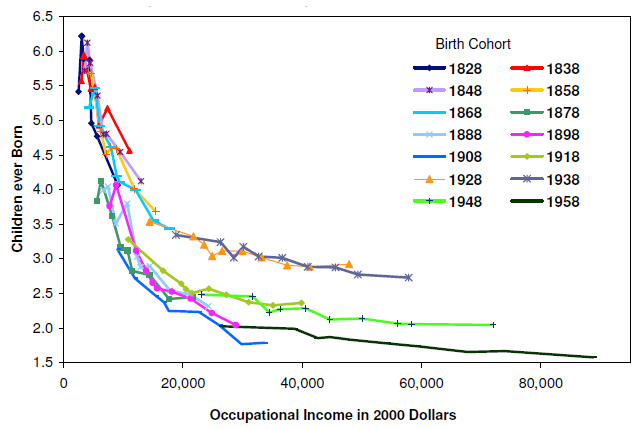 Each downward-sloping line tells the same story for a different cohort: the rich have fewer kids than the poor. And the results show a staggering consistency—this pattern has been true for each cohort for over one-and-a-half centuries. It’s as true for the pre-Pill cohorts as those with access to modern contraceptives. One reason may be the opportunity cost as parents take time from high paying occupations to care for children. Another possibility is that children cost richer families more. We expected to pay over $200K for each of our childrens tuition k through college. We had four anyway because we wanted to but we are definitely outliers in our neighborhood. It might help to look at biology here. How did species that have relatively few offspring ever evolve if having more offspring is better? The answer is that putting more resources into fewer offspring can be a competitive advantage, and that is the case within a species as well as between species. From an economic standpoint, having more children means that available resources (wealth, parental attention) have to be split between the offspring. Too many offspring means that each one gets less compared to a similar family where there are fewer offspring. Kids make people happy, luxury items make people happy. If you can't afford luxury items, you have kids. Rich people have fewer children than poor people because rich people are busy doing rich people things (i.e. becoming educated and making money). Poor people don't have much else to do except go to their job, come home, watch TV, and screw. Rich people also possess better future time orientation than poor people and as such don't randomly have kids they're ill-equipped to properly support. Let's also not dismiss the rise of feminist policies that moved large numbers of women from homemaking (and having/looking after children) to paid employment. Work-life balance and being fulfilled and all that. It would be an interesting, albeit impossible study, to see how things like religion, family history, and other factors play into this. I would conjecture that the rich are somewhat less religious - not that they are necessarily atheist or agnostic, but if an educated man heard "the bible said to be fruitful and multiply", he might think of it in context, while the uneducated might blindly pop out babies (and there is a correlation between education and income). It could also be that if you grew up in a big family, you may also want a big family, and getting richer might barely decrease the size. As an example, if you grew up in a family with 10 kids and went from poor to rich, you still may want 4 kids. There are also things other posters have mentioned like importance of career might also play in. 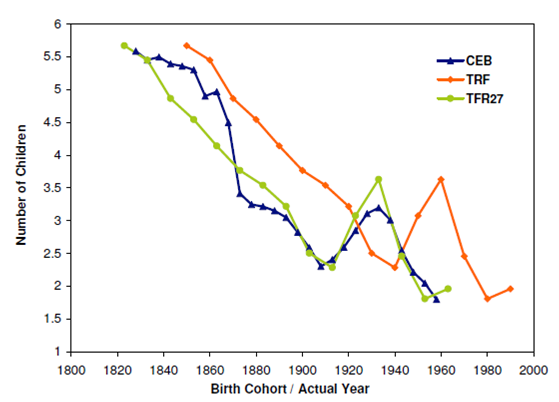 It was shown above a correlation between income and fertility...getting to the causation on this one would be greatly interesting. 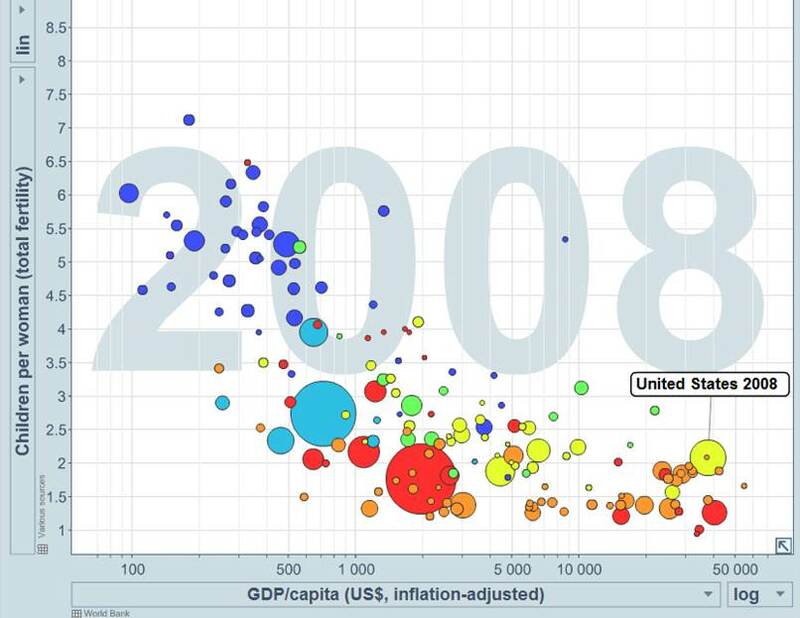 You've omitted Caplan's point about education being a confounding factor (http://econlog.econlib.org/archives/2011/06/kids_are_normal.html). Perhaps there is a fairly simple explanation. Take those "normal" goods, or for an instance (since I just finished breakfast) blueberries. I buy more of them when they're cheap relative to my income, but no matter how cheap they are, I never buy more than I want to eat. Which seems true of any good: I may not be able to afford as much as I want, but I don't buy more than I want even if I can afford it. So employ inverse thinking, and consider access to means of limiting the number of offspring as the normal good. The rich have always had ways (sometimes covert) of limiting the number of children they have to the number actually wanted. The poor have not often been able to afford this luxury, and so have generally had more offspring than wanted. What about the age at which women have children? As countries grow richer, and people within these countries grow richer, the age at which women begin to have children is pushed back. Later start to childbirth = less potential children. One could argue that the wealthier people are the less they are apt to make poor life decisions like buy things they can't afford. It is hard to deny that children do not fit into this category so a properly raised child costs something like half a million dollars over the course of its developmental period. A properly raised child is one that will actually begin to return on its investment. Sure you can have a child, never provide it with any enriching activities, send it to a low cost school and then not provide funding for a college education, but when that child is unable to find employment or gets in trouble with the law instead of providing assistance to the aging parents it will further drain resources from them. In poor countries where unskilled workers can still make a reasonable living the return on investment for a child is much higher. Children can mature as workers in 6-8 years and reach full productivity in their teens. While the return per child is much lower compared to children in developed countries, the costs of the investment are far lower so having a lot of kids can make sense. Fortunately for anyone not engaged in a subsistence lifestyle, the gains to basic education more than offset the loss of early life work potential so if a family can afford basic education they will be more than repaid with increased earnings of their child later in life and more leisure time up front. As living standards rise those without the necessary childhood investment will see their returns go negative thus further encouraging parents to have less kids. A) Kids aren't "goods", and parents don't "buy" them for the same reason they buy goods. So I am not sure that is a fruitful way to look at it. B) A lot of the difference is in unintended kids. i) I would bet the difference between the well off and the less well off on intended kids is much smaller. Conversely the difference in unintended kids is greater. ii) Unintended kids are the result of poor impulse control/planning, which does not correlate well with wealth. iii) Wealthy people also generally having more resources to throw at birth control. iii) Wealthy people also have more to lose when making mistake, which ties in with my next point. i) A less well off person is giving up lower quality things when they have kids. If having kids mean you can only watch 6 hours of TV a night instead of 4, well not such a big deal. If it means you cannot just fly to Switzerland this weekend it is more of a hamper on your style. ii) Less well off people also have fewer meaningful projects in their life (due to a decreased ability to dictate its terms), so children are an attractive option for those who have hit a "meaning" wall. Which ties into the following. i) Well off people have more schooling to get through before it is acceptable for them to have children. Perhaps by this time they are more habituated to their childless circumstances, and have developed habits less compatible with children. ii) Meanwhile the less well off reach a point in their life where they feel like their situation is not going to change earlier. E) Poorer people are more religious. Religion is generally pro-spawning/anti-birth control. You overlook that drops in fertility rates are often associated with urbanization. The fertility rate in Mexico has dropped to 2.1 which is considered ZPG, while they are quite poor compared to the other countries you mentioned. Iran has a fertility rate of 1.8, which is much lower than the U.S.
You have to remember that in rural areas children often have a positive R.O.I., since they can help around the farm. In urban areas children impose a cost on their parents by preventing the mother from working. Apparently a paycheck is an effective contraceptive. I think the question of having more children is much more multi-dimensional than merely "richness" or "poorness". History, religion, technology, culture, and other factors play into the question. Nevertheless, whether kids are a "normal" or "inferior" good, I honestly believe that humanity [or human capital] is the greatest asset this planet has...in particular, the capability of rational intelligence. More precious than gold or silver. Perhaps in the long run the universe's investment in us shall pay off. You are missing the main angle, if you are poor, more kids mean more hands that can do more work and get more food home. If you are really poor, more kids equal a bigger welfare check. What if the same attributes that make a person or country wealthy (single-minded pursuit, a sort of ruthlessness, greed, etc.) also conspire to make them prefer less kids? Wealth not only requires effort from us, but it also gives us many more options. If a child competes with some of these choice options--or perhaps threatens to delay the obtaining of such perks--we might be willing to put off childbearing. Years ago, when a young woman's options were (I generalize) to get married and have a family or be an old maid, the choice, coupled with natural instinct, was to have kids. But now, with it important to finish college, perhaps grad school, to become established in our careers--in other words, the wholehearted pursuit of some degree of status and/or wealth--family matters might get delayed. Oddly enough, even the LOSS of wealth (or fear thereof) might conspire to this end. For instance, if you were a successful lawyer five years ago, but today aren't sure of your future prospects, you might prefer to put off having any more kids in order to, ensure your financial stability. The logical end would seem to be for the wealthy to not have any kids at all. But then you wouldn't have anyone to leave your wealth to, thereby ensuring your memory. Of course, one lady left millions to her cat. Probably a good thing she didn't have any kids (if she did, I feel kind of sorry for them). So are the rich people dying out? If rich families have been smaller for a long time, then presumably they must be making an ever decreasing proportion of the population. (Excluding the social mobility effect of new poor people becoming rich.) Could that in turn help to explain income inequality - massive wealth inherited by ever decreasing offspring while the poor multiply? One area that needs to be address in the Schoonbroodt/Tertilt paper is the difference between wage and actual disposable income. While I agree with the premise of the paper, that wealthier people have fewer children, one cause might be missing. The rapid rise in the cost of a college education has increased the amount of debt students take on. Although graduates tend to earn higher wages than non-graduates, they are also paying an increasing amount to pay for student loans (that cannot be wiped away, even in bankruptcy). Therefore, many high wage earners may appear “richer” than they are. Personally, my wife and I are delaying children because of the massive amount of student loans she had to take out due to law school. We're in the 'we can't afford to have a baby right now' category. In our case, gross wages are not a good indicator of wealth. Assuming a binary model of rich vs. poor, we can outline four factors (which kind of overlap). Some of posters already covered them and did a better job than I might have explaining. 1. r vs. K selection, as Andrea was hinting at: "The answer is that putting more resources into fewer offspring can be a competitive advantage, and that is the case within a species as well as between species. " Wealthier nations tend to follow a relatively higher K strategy, and poorer nations r strategy (twinning and multiple birth rates are higher in Africa, lower in Europe, and lowest in East Asia, so there's a biological component to r/K selection as well). Within the U.S., wealthier people tend to follow a K strategy and poorer people r strategy. Being wealthy or poor could trigger some sort of evolutionary instinctual response to follow K or r strategy, respectively. 2. Wealthy people tend to be more intelligent and better educated than poor people, which comes with better impulse control and future time orientation, as Joshua Northey noted: "A lot of the difference is in unintended kids... I would bet the difference between the well off and the less well off on intended kids is much smaller. Conversely the difference in unintended kids is greater... Unintended kids are the result of poor impulse control/planning, which does not correlate well with wealth." Inkraven remarked: "Rich people also possess better future time orientation than poor people and as such don’t randomly have kids they’re ill-equipped to properly support." 3. Feminism. Encouraging women to pursue education and careers pushes back the year they tend to have kids, which cuts their reproductive window. 4. Opportunity Cost. Inkraven speculated that rich people have "rich people things" to do. Joshua Northey wrote: "A less well off person is giving up lower quality things when they have kids. If having kids mean you can only watch 6 hours of TV a night instead of 4, well not such a big deal. If it means you cannot just fly to Switzerland this weekend it is more of a hamper on your style... Less well off people also have fewer meaningful projects in their life (due to a decreased ability to dictate its terms), so children are an attractive option for those who have hit a “meaning” wall. " One of the best comment threads I've ever seen on Freakonomics. Hopefully the insightful posts don't get "hidden due to low comment rating" because it triggers readers' PC indignation. Next Post »The Cost of Eating Organic Food; or: Will E. Coli Increase Our Appetite for Irradiated Food?